It was going to be a regular day. I dropped the kids off at school, went to town to run a few errands and was getting ready for work when my mobile started ringing with the school's number flashing across the screen. Martha had fallen and bashed her head, there was quite a bit of blood and the first aider thought she might even need glue. From there everything happened really fast; running out of the house making calls to Mark and to work, to my parents and grandparents. Driving to school not knowing what I'd be dealing with when I got there. Martha was sat on the sofa with her teacher when I got there. She'd stopped crying not long after she'd fallen but she was quiet. According to her teacher, she had been quite pale but some colour had returned to her cheeks. Her hair was matted with blood and I didn't want to interfere too much, worried I'd hurt her. Mark's work is on our way to the Hospital, we picked him up and made our way to A&E. We were seen quite quickly by the triage nurse; took Martha's obs and we were relieved to see that her sat's were at 98%. Having a Heart Condition complicates things even further. Because of her age, the fact that she had a head injury and that she had a history of heart problems - we had to wait for a Doctor to see her. 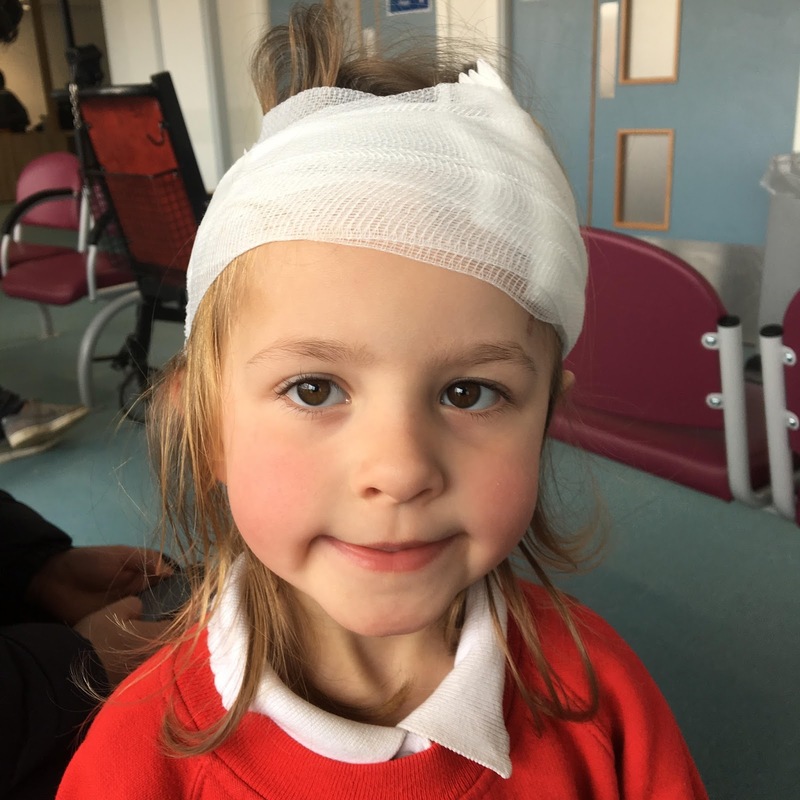 Our main concern was for her head wound, we wanted to make sure it was clean and to prevent any infection from taking hold and that it could heal properly with/without glue or stitches. Martha spent the afternoon playing at being a nurse, putting plaster and bandages on me and Mark and asking us if anywhere hurt. She ate her packed lunch and sipped from her water bottle and was able to keep it down. We knew that she was OK in herself. But it doesn't make any difference to the way I felt today. I've never understood why people say they are scared of Hospitals, but I certainly can sympathise after today. We do our best to keep our kids out of Hospital. We hold out as long as is reasonable before taking them to the Doctors. Most of our time in hospitals is spent waiting! Waiting for Martha to go down to theatre. Waiting for Martha to come out of theatre. Waiting for Martha to come around and come off the ventilator. Waiting for Martha to recover so we can bring her home. Waiting to be called in for her appointment. Waiting for the good or bad news from her consultant. Even though I knew that we were only waiting for her head to be looked at today, I had all the feelings that I have for surgery days. My heart was racing, anxiety through the roof. I don't know what I was scared of, even though it's a completely different hospital to the one we're used to. But the sight, sounds, and smells are all too familiar. I've been quite teary this evening. Although I know that Martha is OK now, that phone call from the school could have been a totally different one. I live in fear of our worst-case scenario and each time I get a call from the school I imagine that it's happening and I'm in "fight-or-flight" before I've even picked up the phone. We left the hospital with a leaftet on head injuries and a list of symptoms to look out for over the next few days. I left grateful that after an afternoon at A&E, I was able to bring my baby girl home.